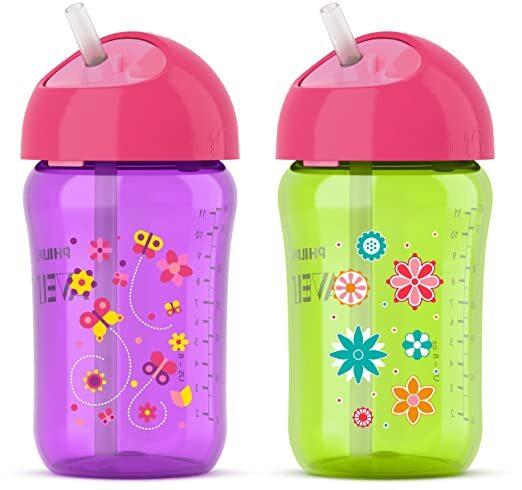 I had heard from other mom friends that the transition from bottles to sippy cups could be a tricky one. So, I tried to get ahead of the game and introduced a sippy cup with a straw to Rocklyn just for water when she was about 6 months old. She barely drank out of it at first but would just gnaw on the straw, play with it, then after about a month she figured out she could get water out of it and actually started using it. Before long she was sucking down water like a champ with her food. I gave my self a high five and thought, “great, when it is time for milk this will be easy peasy!”. Not exactly. At this point, she was only getting milk 2-3 times a day, therefore it was no longer her sole nutrition. This was a good thing because when we took the bottle out cold turkey, she went from drinking about 15 oz a day to maybe 6oz. She would take a couple sips and then throw it down. But I would never swoop in with the bottle, we just kept trying and kept offering it to her. I would say it took her about a week before she started taking all the milk out of the sippy cup. So, the first few days I was indeed a little panicked, but I was also more sad. I could tell she really wanted her bottle and was getting frustrated and that made me feel so bad. But again, after a week she seemed to care less, I was just being a sap. I have learned over the years of watching other people’s kiddos and now raising my own that consistency is key for all ages. Especially when it is time to change something up or enforce a new behavior. Giving in can take you a million steps backwards and these little buggers know how to play you! I am pretty sure no adult has ever brought up in counseling how traumatized they were when their parents took away their bottle or pacifier, yet doesn’t it feel like that is what we are doing to them when we go through a change? As it turns out, it is harder for us than it is for them, almost always. See picture above with my happy child drinking her morning milk out of her sippy cup. Bottle? What is a bottle?